This week we’re in Cape Ann, MA. This small, rocky spit of land about 30 miles north of Boston contains the towns of Gloucester, Rockport, Essex, and Manchester-by-the-Sea. 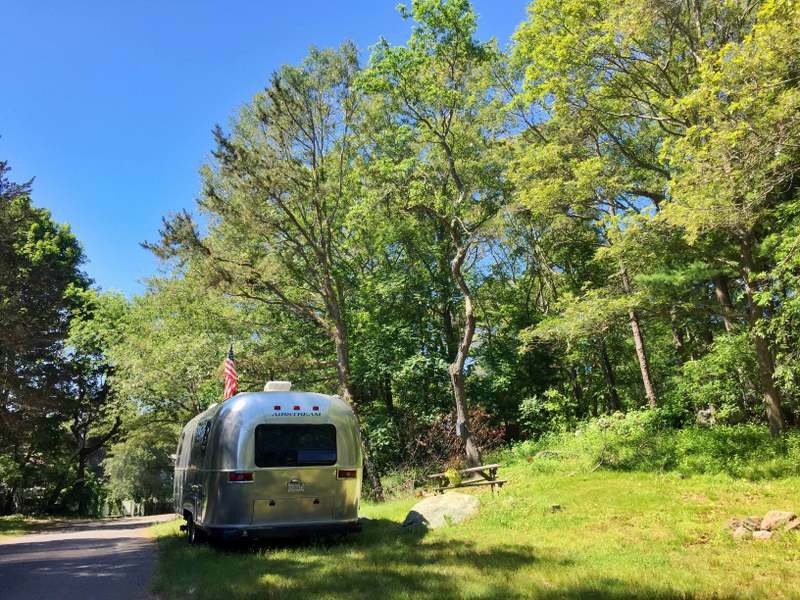 We’re staying in Gloucester at the Cape Ann Campsite about five miles from town, and a mile from Wingaersheek Beach (you know you’re in New England when the landmarks, streets & towns contain a few too many vowels). The beach has a steep $20 price tag for parking (another sure sign that you’re in NE), but it’s free to bike in. One day after work we made the short ride from the campground to the beach. 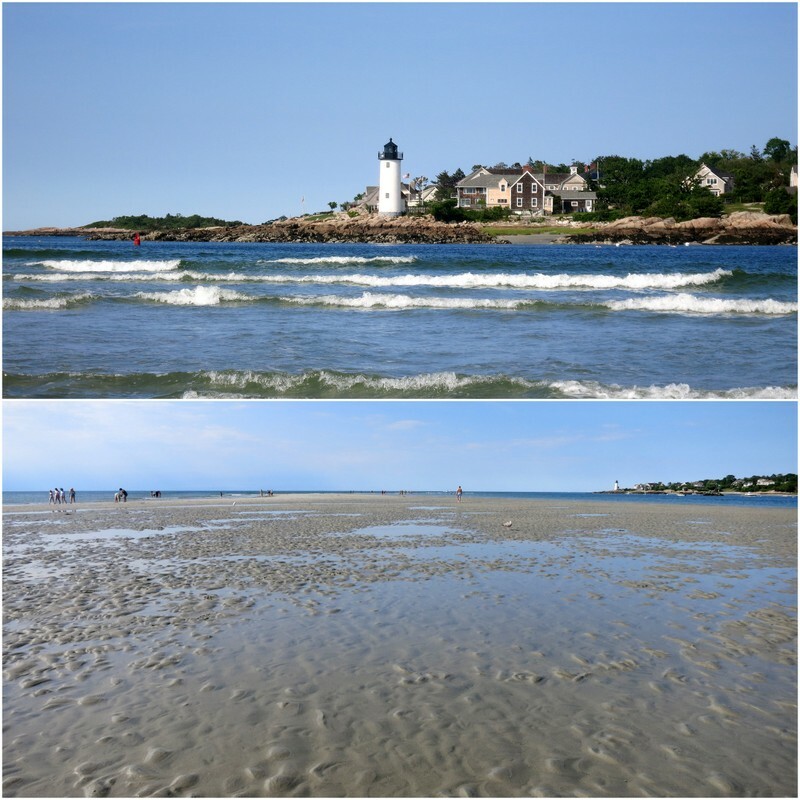 It was low tide and we walked way out on the a stretch of exposed sand to get a glimpse of the Annsiquam Harbor Lighthouse. 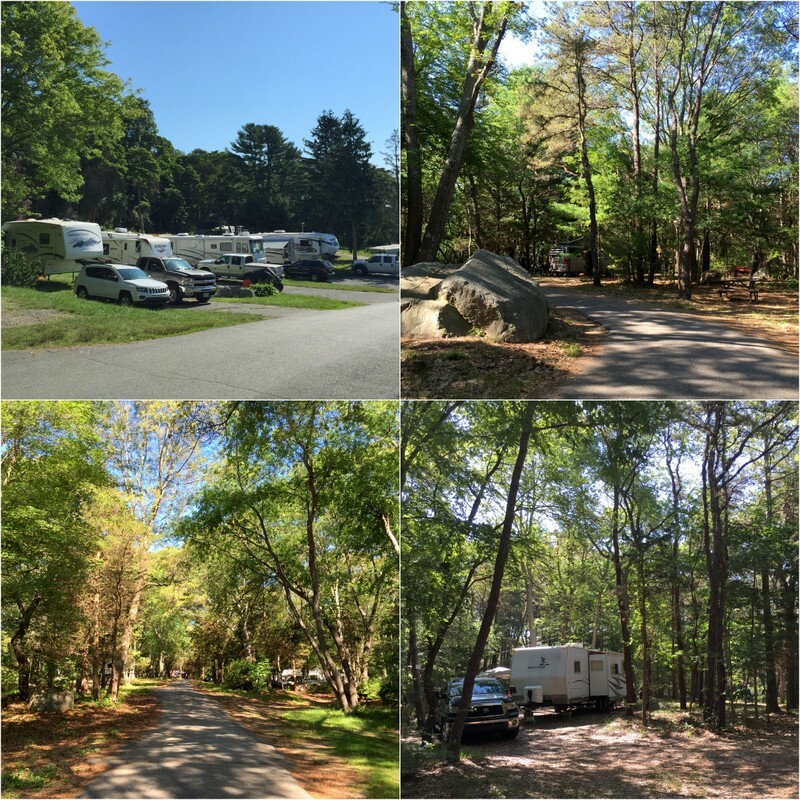 Cape Ann Campsite has the strangest layout of any campground we’ve ever seen. 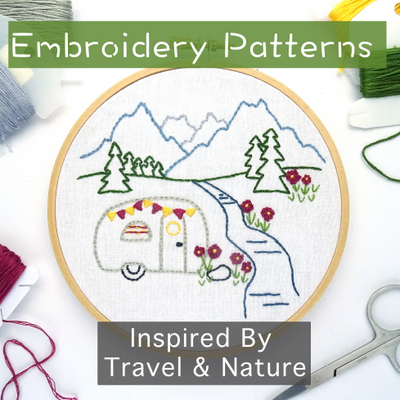 The entire campground is on a hill with tight winding roads that go up into the trees where the majority of the sites are located. Some of the sites at the top of the hill are clearly for tents or small RVs only, but there are a number of nice sites up there for medium size RVs such as ours. There are also about 15 sites near the entrance of park for large RVs with full hook-ups including 50 amp electric. When I made the reservation here months ago (because…holiday weekend) I asked if it was possible to get a no hook-up site with enough sun for our solar panels. A positive response followed, and when we arrived they put us in site 14, which is actually an electric/water site. But since we didn’t plan to use the hook-ups they only charged us the dry camping fee of $34/night (yup, we are definitely in NE). It was not the nicest site in the park with a slanted front yard, and a back yard practically in the campground road, but we did get plenty of sun for the panels. Good thing since they don’t allow generators here. Next time, I think we would just pay the extra $8/night for electric and get a better site. Still, not a bad place to spend the week, and in a very convenient location close to everything we wanted to see. When we checked in the very nice lady at the front desk gave us a run down of all the local activities. She mentioned that although we had just missed the annual St. Peter’s Fiesta, a few events from Sunday had been cancelled due to rain and were rescheduled for Monday evening. One of those events was the Greasy Pole competition. She described it as, a bunch of guys drinking bear and running across a greasy pole suspended above the water. Okay…count us in. Before the greasy pole event started we watched the seine boat races. Three boats — the Nina, the Pinta, and the Santa Maria — manned by 12 crew members each, rowed out half a mile, turned around and rowed back to shore. The boat that hits the beach first was declared the winner. 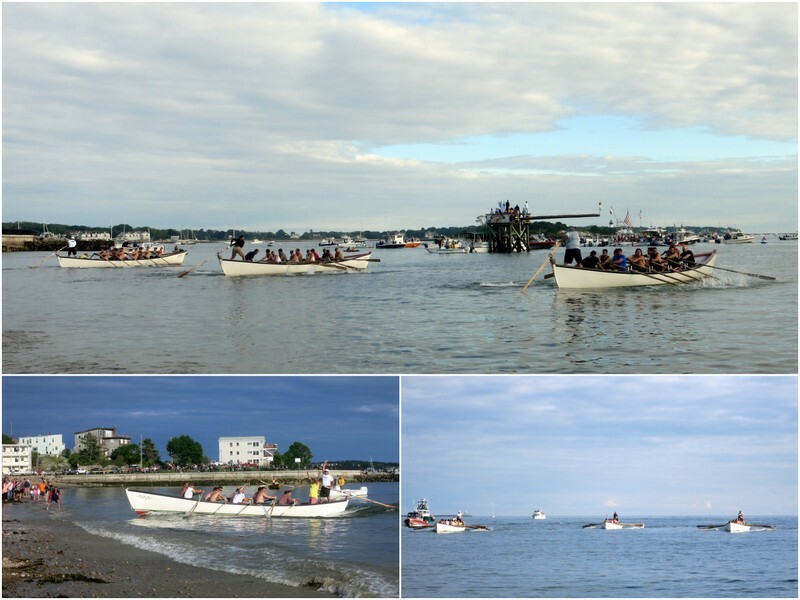 All three boats were neck and neck for most to the race, but at the last minute the Nina pulled ahead for the win. Seine Boat Races – going out – coming back – the Nina wins! Next up was the highly anticipated greasy pole competition. The Fiesta is a big deal in Gloucester (to sound like a local you have to pronounce it Gloss-tah), and the crowd on the beach was thick with people of all ages eager to watch grown men and women race across a heavily greased telephone pole with the goal of reaching the flag at the end. It took at over 30 minutes for someone to make it all way across. Unfortunately, we didn’t capture the moment, but here are some of the failed attempts. That’s about it for the week. 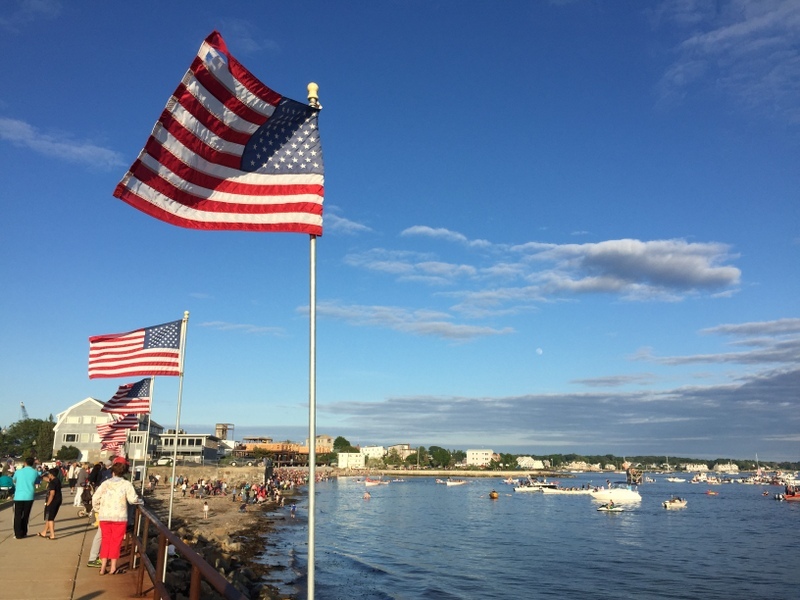 We do have some fun plans for the long weekend ahead, starting with a guided kayak tour out to an island to see some lighthouses this afternoon, two parades, fireworks, and hopefully more time at the beach. Wishing everyone a wonderful 4th of July weekend! Sounds like great fun. Thanks for the heads up on campground rates out that way! The north east is definitely pricy on the coast. But I guess you could say the same about the Florida or California coast as well! $20 to park at the beach sounds like Southern California! 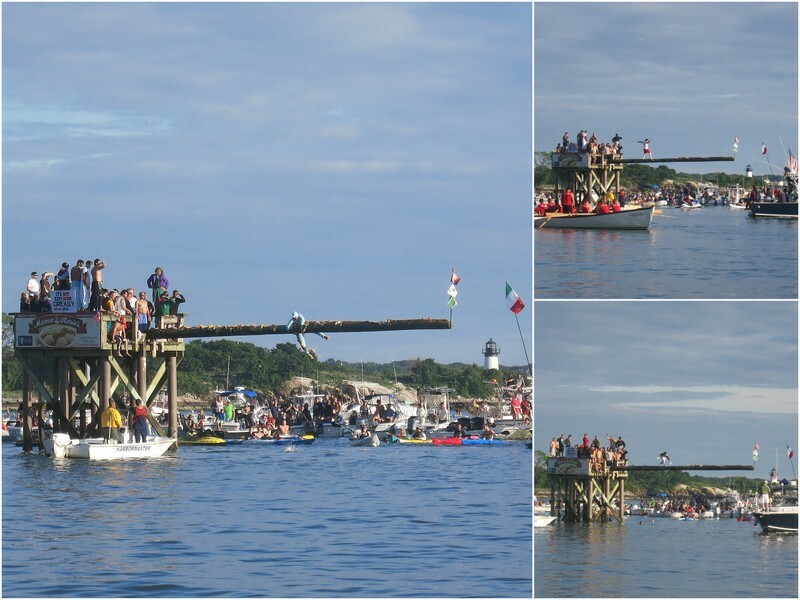 That greasy pole competition is a crack up….despite the grease I am imagining splinters from falling on the damn pole, broken bones, all sorts of dangerous mishaps!!! Wishing you a relatively peaceful and campfire free 4th of July! Right now we are sitting in a practically empty RV park but we’ve heard it is full up over the weekend…With any luck all the campfires will be at the other end of the park! Cheers! The crazy thing is how many people pay that price. The parking lot was packed! We heard stories about broken ribs and other injuries from the greasy pole. We saw what looked like some pretty painful falls. Happy 4th to you as well! I spent a lot of time in Rockport when I lived in Boston — it was one of my favorite spots to get away from the city. Looks like a fun place to spend the 4th! Thanks for the campground tip. We visited Rockport on a day trip once many years ago and have always wanted to return. Turned out to be a great place to spend the 4th. We love those small town celebrations. We have not gotten up to NE yet since RVing. Looks like a nice area. Thanks for the campground info. NE can be challenging in an RV. With a lack of space the campgrounds tend to be tight and expensive. Still worth a visit in my opinion. Next week we’re headed to Maine which is one of my all time favorite places!